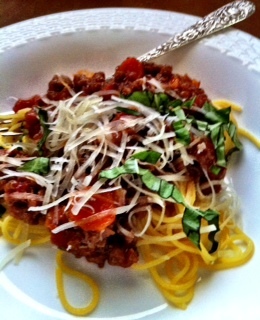 I know this seems out of season, but we love spaghetti and meat sauce any time of year. Due to my heritage, without a spec of Italian blood I am at full liberty to make up anything which tastes great on pasta. Although I lament I have never had that grand matriarch in my life, I have taken this opportunity to create my own tradition with this highly personal dish. This combination is a result of a long time of change, family input, trial and error. I feel it is worth publishing now. So here you go, I am sure there will be controversy…. This entry was posted in Family, Recipes and tagged anise seed, Bacon, beef, Pasta, Tomato Sauce. Bookmark the permalink.